Once upon a time (in 1988 to be exact) a Frenchman named François Pasquier returned to Paris after a period of living abroad. He wanted to celebrate his birthday with friends he hadn't seen while away but didn't have enough room at his place. So he decided to organise a picnic in the Bois de Boulogne instead. Not your average picnic of course, this one had chairs and tables and a proper meal (as the French seem to do, take something normal and Frenchify it into something chic..!). Back in the day, before the introduction of widespread mobile phone use, the group opted to dress in white in order to spot each other more easily in the Bois de Boulogne (the Boulogne Woods). Little did they know that in doing so, they would be giving birth to a future worldwide phenomenon and the largest 'impromptu' dinner party ever known to exist. The group of friends enjoyed the first event so much that they decided it would have to happen again the following year. The second year was just as successful as the first and so they repeated it again. The third year saw everyone bring along a guest and by 1990 three, there were over 100 people attending the event. Over the next few years the DEB began to grow exponentially. It wasn't planned or organised like that, it just took off on its own. One year, the police prevented the group from their yearly tradition. From that point on, it was decided that the location would be kept a secret until the last minute for three reasons a) to keep the police away b) so that the Dîner en Blanc wouldn't end up being a crazy 100,000 person event and c) to keep the excitement and magic of the tradition alive. Rules, guidelines and codes of conduct were established to manage the ever growing event. Soon enough, the little get together that casually started among the group of friends in 1988 had become a protected brand. The official Dîner en Blanc brand has now licensed 60 cities in 34 countries to join DEB International, spanning across all 5 continents with 150,000 participants worldwide. Paris is the only city whose event operates on the traditional invite-only basis. Other cities around the world operate a little differently with registration websites and waiting lists as well as sponsors and on-site catering options. The Dîner en Blanc in Paris is also technically illegal, however authorities have become familiar with this event and above all understand that official organisers respect the public space and are trusted to disappear at midnight and leave the site exactly how they found it. DEB doesn't charge local hosts to join its international network, it only asks that the overseas event organisers and participants respect the guidelines set out to help preserve and pass on the true spirit and values of the Dîner en Blanc, l'art de vivre from one city to another, from one generation to another. For more information on how to set up a Dîner en Blanc in your city, click here. 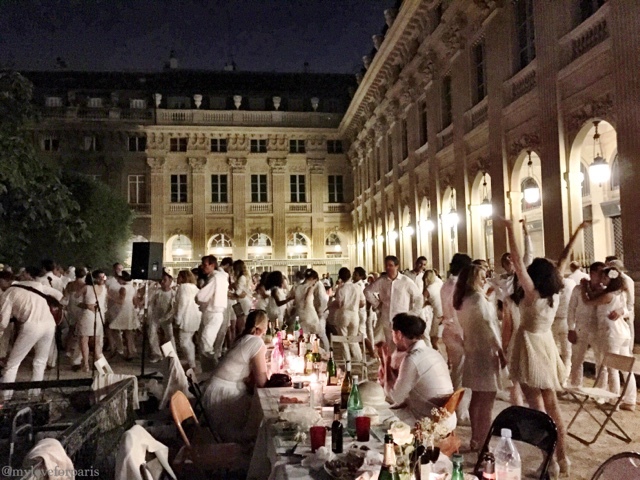 This year's official Dîner en Blanc was held at the Jardin du Palais Royal, with the number of invitations reduced down to 10,000 following a series of events that occurred last year. 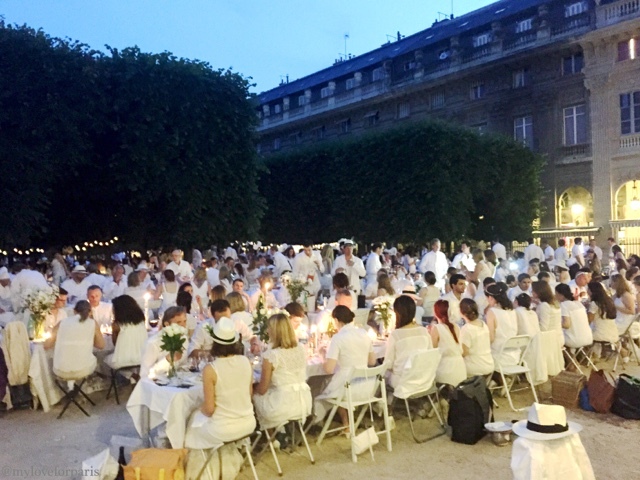 A second unofficial Dîner en Blanc was held near the Carrousel du Tuileries on the same day at the same time. Around 3000 to 4000 people attended this second event, reportedly organised by a group who had previously joined the Dîner en Blanc organisation agreeing to respect its guidelines however were not reinvited to this year's event after displaying inappropriate behaviour in 2014. The disappointing state of the Carrousel du Tuileries left by the second group was noted on social media the morning after. 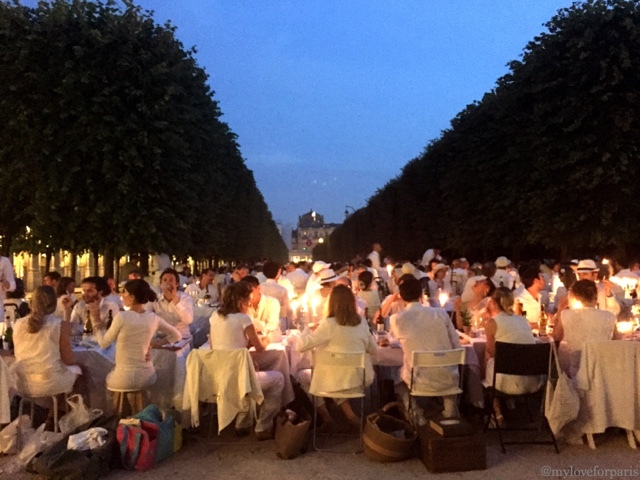 After 27 years in Paris, the official Dîner en Blanc has made quite a name for itself. It's quite impressive if you think about it. An event of this magnitude, of 10,000 attendees being run with such order, self-discipline and respect for others - all without any security guards, police nor 'staff' on site. Here's hoping that this beautiful tradition of bringing together people from different generations and different backgrounds to celebrate l'art de vivre will continue on for another 27 years with the same decorum and elegance as that historical day in June 1988. PS A few video clips from the evening to share!